Feb. 17, 2010 -- The Fowler Center Series presents its seventh event of the 2009-10 season with multifaceted string quartet Brooklyn Rider in performance Saturday, March 13, at 7:30 p.m., Riceland Hall, Fowler Center, 201 Olympic Drive, Jonesboro. Brooklyn Rider has become increasingly known for its creative programming and exciting collaborations which serve to illuminate music in new ways and invite audiences into a shared experience. Uniquely able to address a wide and inclusive range of music, they are as willing to explore the world of Haydn as they are in the music of today. Brooklyn Rider has performed in venues as varied as Joe’s Pub in New York City, Todaiji Temple in Nara, Japan, and the Petronas Towers in Malaysia. Born out of a desire to use the rich medium of the string quartet as a vehicle for borderless communication, all of the musicians have enjoyed diverse careers in music that have intersected with each other over many years. Personnel for Brooklyn Rider are Colin Jacobsen, violin, Johnny Gandelsman, violin, Nicholas Cords, viola, and Eric Jacobsen, cello. The members of Brooklyn Rider are devoted to both the interpretation of existing quartet literature and to the creation of new works. They have worked with composers such as Chen Yi, Osvaldo Golijov, Dimitry Yanov-Yanovsky, Shirish Korde, Ljova, and Jenny Scheinman, as well as the original compositions and arrangements of Brooklyn Rider’s own Colin Jacobsen. The program Brooklyn Rider will present at Fowler Center includes Colin Jacobsen’s "Achille’s Heel," Dmitri Yanov-Yanovsky’s "...al niente;" Giovanni Sollima’s Federico II from "Viaggio in Italia;" John Cage’s “In a Landscape,” arranged by Justin Messina; and Claude Debussy’s String Quartet. Exploring new possibilities through collaborative programs is a frequent part of Brooklyn Rider’s work. Some examples include programs with Chinese pipa virtuoso Wu Man, Syrian/Armenian visual artist Kevork Mourad, traditional and technology-based Japanese shakuhachi player Kojiro Umezaki, and singer/songwriter Christina Courtin. A long-standing relationship with Persian kamancheh player and composer Kayhan Kalhor will result in a CD release, “Silent City,” later this year on World Village Records, the world music label of Harmonia Mundi. Much of Brooklyn Rider’s desire to extend the borders of conventional string quartet programming has been through its longstanding participation in Yo-Yo Ma’s Silk Road Ensemble, a group dedicated to exploring the cultural intersections of the peoples along that ancient trade route. As members of the ensemble, they have performed throughout the world, recorded three albums for Sony Classical, and have reached audiences through a series of educational initiatives, family concerts and media broadcasts. Brooklyn Rider has also taken part in a series of museum residencies initiated by the Silk Road Project that have taken them to the Rubin Museum of Himalayan Art in New York City, the Art Institute of Chicago, the Museum Reitberg in Zurich and the Nara National Museum in Japan. They have also participated extensively in ongoing Silk Road Ensemble residencies at Harvard University and the Rhode Island School of Design. As educators, members of Brooklyn Rider have been in residency at Williams College, the University of Delaware, the School for Strings Summer Institute in New York City, and Macphail Center for the Arts in Minneapolis. Next year will include a week-long series of events at Dartmouth College. They have also been featured on John Shaffer’s Soundcheck, Minnesota Public Radio, and they were invited in 2005 to help curate a weeklong residency at National Public Radio’s Performance Today. Audience engagement and outreach is an essential part of the quartet’s creative mission. To further their reach, Brooklyn Rider often appears under the umbrella of outside initiatives begun by all four members of the group. Two summers ago, they collectively inaugurated the Stillwater Music Festival in Minnesota, providing concerts and outreach activities designed to connect communities in the St. Croix Valley area. In 2003, violinist Johnny Gandelsman created In A Circle, a series of performance events in Lower Manhattan and Brooklyn that explore connections between music and the visual arts. Brothers Colin and Eric Jacobsen are the founders of the Knights, a chamber orchestra based in New York that has recently appeared at Long Island’s Beethoven Festival, Dublin’s National Gallery, and will be featured next summer at the Dresden Musikfestspiele. The quartet’s name is inspired in part by the creations, interests, and cross-disciplinary visions of the Blue Rider group, an artistic association founded in 1911, whose members included Vassily Kandinsky, Franz Marc, Arnold Schoenberg, and Alexander Scriabin, as well as others. In the spirit of those sympathetic friendships, Brooklyn Rider has created an online art gallery (http://www.brooklynrider.com/ --click on the gallery sign) showcasing the work of peers in the visual arts; the proceeds are used to support new commissioned projects. The quartet also draws additional inspiration from the exploding array of cultures and artistic energy found in the borough of Brooklyn in New York City, a place the group calls home. 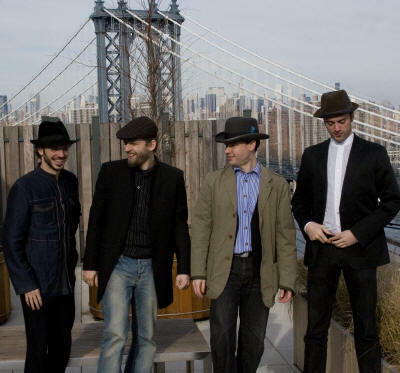 Visit Brooklyn Rider online at http://www.brooklynrider.com/ to listen to samples of their music, read reviews of performances, view the art gallery, and view the group’s videos. Ticket prices are $30 and $20 for adults; $24 and $16 for ASU faculty and staff; $23 and $15 for senior adults and K-12 students; and $10 and $6 for ASU students. Tickets for all Fowler Center Series events may be purchased by calling 870-972-2781 or 1-888-278-3267, or online at www.yourfowlercenter.com. On performance evenings, the box office in Fowler Center opens one hour prior to the event. Visit www.yourfowlercenter.com for additional information, or call Fowler Center at (870) 972-3471.